The Tele-Immersive Data Explorer is a CAVERNsoft-based collaborative, immersive environment for querying and visualizing data from massive and distributed data-stores. 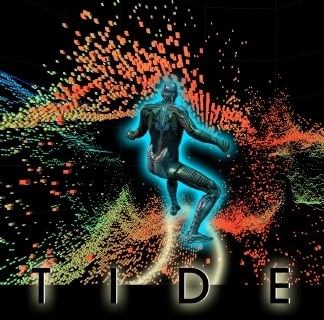 TIDE is designed as a re-usable framework to facilitate the construction of other domain-specific data exploration applications challenged with the problem of having to visualize massive data-sets. At Supercomputing 1999, TIDE clients running on ImmersaDesks at various exhibit booths (notably the National Center for Data Mining, Argonne National Laboratory, Alliance and ASCI booths,) will collaboratively query and correlate data distributed amongst several DSTP (Data Space Transfer Protocol) servers. DSTP is a next-generation data mining tool for the distribution, inquiry, and retrieval of data columns for correlation studies. Leigh, J., Johnson, A., DeFanti, T., Bailey, S., Grossman, R., " A Methodology for Supporting Collaborative Exploratory Analysis of Massive Data Sets in Tele-Immersive Environments", 8th IEEE International Symposium on High Performance and Distributed Computing, Redundo Beach, California, Aug 3-6, 1999. Sawant, N., Scharver, C., Leigh, J., Johnson, A., Reinhart, G., Creel, E., Batchu, S., Bailey, S., Grossman, R., " The Tele-Immersive Data Explorer: A Distributed Architecture for Collaborative Interactive Visualization of Large Data-sets", 4th International Immersive Projection Technology Workshop, Ames, Iowa, June 19-20, 2000.